“Doc” Edgerton was an American inventor who is best known today for Stop Motion Photography, in which he captured high speed events on film. His innovations include the electronic flash and the strobe light. The strobe light, used in the photograph above, emitted up to 120 flashes of light per second, allowing the camera to capture even a speeding bullet as if it were suspended in mid-air. 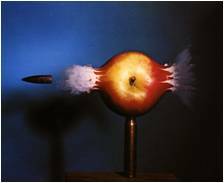 Doc Edgerton’s photographs of his experiments, such as the one on this page, became very popular with the general public and helped promote the idea of “popular science,” the notion that science can be fascinating, and fun! The Oxford Companion to Photography. Robin Lenman, Editor. Oxford: Oxford University Press. 2005.